What is the normal size of hot fix tape? How long of one roll tape? The hot fix tape standard length is 100 meters. However,you can also request it to be other length such as 90meters,85 meters or 80meters. The most common width of hot fix tape is 24cm,28cm,32cm. As for the length of hot fix motif design, it is according to your needs to cut or is customized by factory. 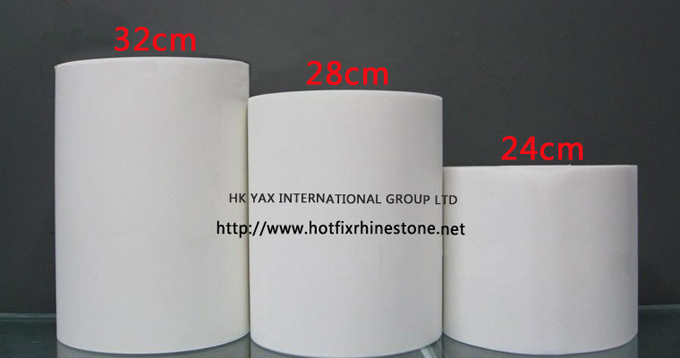 You can ask factory to custom made the width of hot fix tape,for example, we can let it be 20cm,22cm,26cm,34cm,36cm,40cm for any custom size. Note : The hotfix tape width only can be even number,can not be odd number. If your customers have to ask it to be odd number,it is a waste actually, the price should still be a even number after +1.